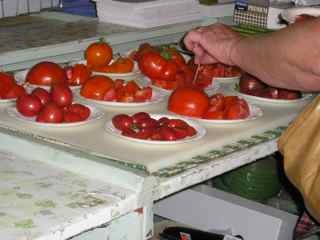 The other day, before the Melon Tasting at Nichols Garden Nursery,we had a Tomato Tasting! What a fabulous day to be there!! 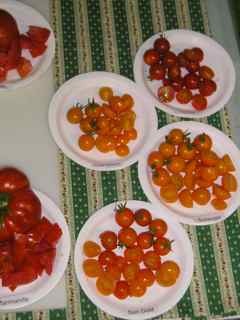 We had a baker’s dozen of tomato varieties to taste. A group of foodie/garden writers is sitting with me now at Rose Marie’s kitchen table: Josh Young, Jim Long, Jane Whitfield, and Ros Creasy, tasting the cherry tomatoes… ‘Sun Gold’ and ‘Sunsugar’ were indistinguishable – basically we loved the orange cherries!! If you’re in the area, come to Nichols on on Saturday the 20th from 1 to 4 pm and judge for yourself. Looking forward to hearing what your favorites are…. I’ve decided that I’m not just an itinerant gardener; I’m an itinerant foodie as well. The other day, I had the pleasure of being at Nichols Garden when Mike Hessel, the “melon man” brought eight crates of different melons. The scent as he came in the door was sweet perfume!!! 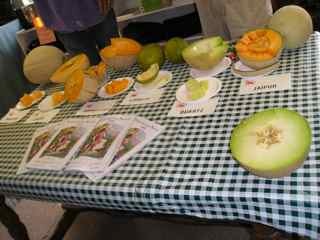 They set up a melon tasting preview for this week’s “Garden Time” TV show, and we all got to taste the melons. My favorite was “Hannah’s Choice” with “Jaipur” a close second. You can come and taste for yourself during the Tour De Plants – Friday the 19th from 11 am to 4 pm and on Sunday the 21st from 1 to 4 pm. Nichols will be offering the seeds next year for these melons; if your taste buds crave more melons before then, if you’re in the Willamette Valley, you can buy the melons at New Season’s Market. Tonight, we’re having mixed melon balls with vanilla ice cream …and Stam Chocolates (a Dutch delight in Des Moines). Here’s a link to La Tomatina an annual tomato food fight in Bunol. Spain. Participants really get into it vigorously throwing ripe tomatoes at one another for an hour. When all is done the street and people are hosed down. Here’s the link. In case you’ve been wondering what happened to the Des Moines Garden…it’s a tale to tell! Long story short, I am a renter, and despite the fact that my front-yard garden had been on local TV three times, featured in Des Moines Register twice, and photos of the garden had been included in several of my books as well as a number of lectures, my landlord didn’t get it. Not that anyone complained about the garden; in fact the neighbors loved picking ‘Snow White’ tomatoes as they walked by (and since it sprawled, dogs nibbled the sweet fruits, too) and chat about other plants. So, two years ago we had a “Divide and Conquer” weekend, and divvied up what was in the garden among friends and neighbors. 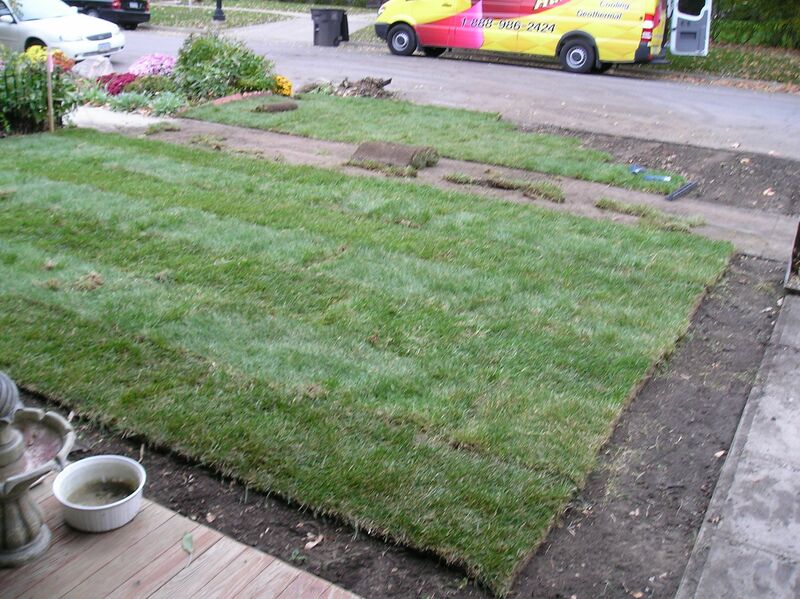 It was not until a full year later (last fall) that the landlord finally put in sod. 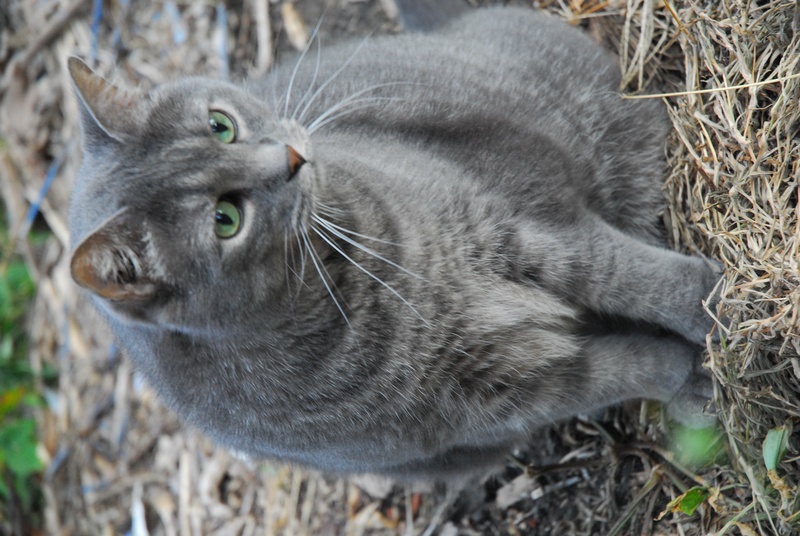 Of course to me, lawn is a nasty four-letter word – a waste of resources, time, and energy, and not edible, although my cat Bogart loves to nibble it (and is the only cat I know to eat grass and not get sick). Sorry, I can’t seem to get Bogart upright! In the meantime, I have become “The Itinerant Gardener,” getting my hands in the earth whenever and where ever possible – from Des Moines to California this year. And yesterday, I landed in Portland Oregon to spend some time with Rose Marie before and after the annual Garden Writers Association symposium. 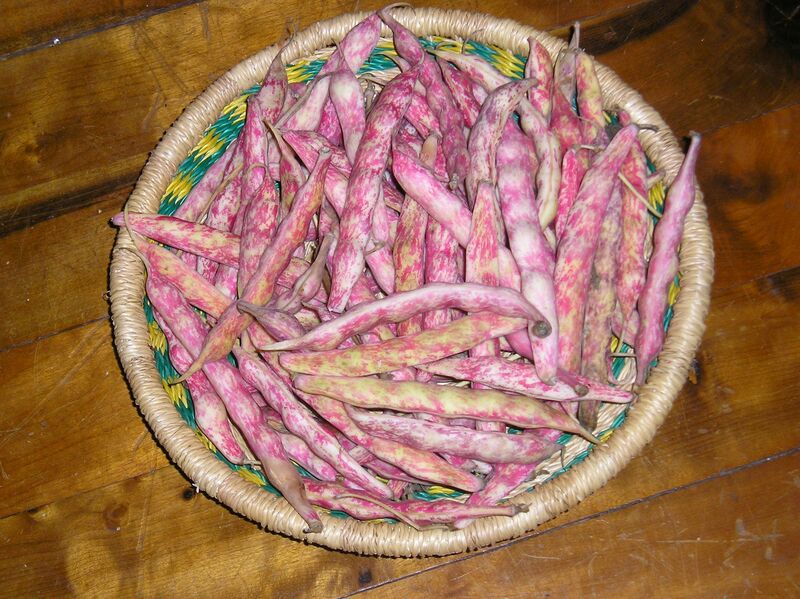 I’m so excited to have been able to see and taste what will be a new addition to Nichols’ 2009 catalog – the ‘French Horticultural’ shelling (cranberry) bean seen here. Aren’t they just gorgeous? At this point the beans are not dry, so the color of the bean inside is not completely developed.As the pods dry, the cream color yellows, and the cranberry pink deepens a bit. At this stage, it took Rose Marie longer to shell the beans than to cook them. She put them into water in which she’d been boiling a ham bone, some sliced onions and a bay leaf. The beans were ready in less than 10 minutes, but she wanted to cook down the liquid. This is why recipes are tested several times before Rose Marie puts them up on the blog. Anyway, it was after we had licked the last of the serving bowl that it dawned on me that I should have photographed the yet unnamed dish. Perfect for a cool evening’s dinner. Happy Gardening. Enjoy the fruits from your garden, where ever you are!